Teeth fillings are placed to restore a tooth back to its functional or aesthetic state. Besides tooth decay, tooth filling is also done for cracked and broken tooth, worn teeth, bruxism (teeth grinding) and other reasons. However the problem of tooth pain after filling is done can be quite common. Should I be worried if I have tooth pain after a filling? Some people experience some sort of sensitivity after they receive a filling. The tooth may be sensitive to pressure, air, sweet foods or cold. Composite fillings often cause sensitivity, but other types of filling materials can also induce sensitivity. In most cases, the pain lasts only for a few days or will subside over one to two weeks. If the tooth is extremely sensitive or the sensitivity does not decrease after two weeks, it is best to contact the dentist who performed the filling. The first type of pain is experienced when a person bites, and worsens over time. This is caused by a filling that is too high and interferes with the bite. The filling will need to be reshaped or in the worst case, be refilled. The second type of discomfort is a very sharp shock that appears only when the upper and lower teeth conatct each other. This shock is called ‘galvanic shock’ or ‘electrogalvanic pain’. It is caused by two metals (one in the newly filled tooth and one in the tooth it’s touching) producing an electric current in the mouth. This is common where a gold crown contacts an amalgam filling. What are the likely causes for tooth pain after dental filling? Placement of fillings may cause the tooth pulp to experience a sudden shock which can lead to severe tooth pain after filling. This is especially worse with deeper fillings that are close to the nerve of the pulp. Accidentally burning the pulp during cavity preparation, especially when the remaining dentin is thin and when there is inadequate water coolant sprayed during cavity preparation can lead to sensitivity to hot or cold is felt as the pulp is inflamed. This can be a short-term reaction to a deep filling but if this sort of toothache persists, a root canal treatment would be required. Electrogalvanic pain is another pain triggered by tooth-tooth contact. It is caused by two metals (one in the newly filled tooth and one in the tooth it’s touching) producing an electric current in the mouth. 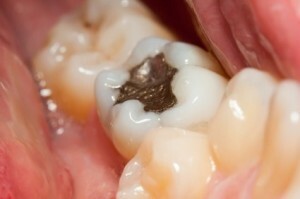 This is common where a gold crown contacts an amalgam filling. A cavity which is not properly filled can cause pain due to exposed dentine. A filling with rough or sharp edges can feel sharp in the mouth and therefore needs to be polished properly so that there is no interruption in the normal functioning of the teeth and the jaws. A high bite or an occlusal high spot on the recently placed filling can lead to bruising of the tooth supporting tissues (acute periodontitis). This may only become apparent after the local anesthetic wears off or after chewing in a particular way. There would be great tenderness on biting and the pain from the bruised periodontium would be present at other times. Also, such pain of periodontal ligament origin should be well-localized. The restoration will need readjusting to prevent further problems. 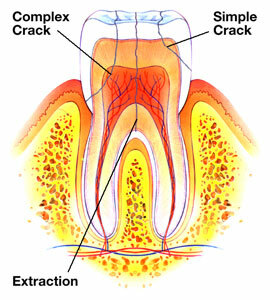 A crack in the tooth is a possible cause suggested by pain on biting. It is triggered by tooth-tooth contact. Fillings are not as strong as enamel therefore are more at risk of breaking over time. The risk of cracking depends on the size of the restorations. A large restoration is more likely to crack as more original tooth structure is missing. Some people have allergic reactions to the material used for their fillings, such as silver. However this is very rare with less than 1% of people have a proven allergy to something in silver or amalgam fillings. The symptoms include itchiness, redness or a rash on the gum/cheek beside a tooth that is filled. Nerves of the filled tooth can pick up signals from the nerves of the nearby teeth as they are connected by the same main nerve. Therefore this can be the reason for tooth pain after cavity filling. Traumatized teeth that were not involved in the filling process may cause severe pain in tooth after filling. What is Composite/Tooth Coloured Filling Material? This entry was posted in Oral Care and tagged a cracked tooth, cavity filling, dental filling pain, pain after filling, pain in tooth, root canal treatment, teeth filling, tooth feeling, tooth pain on June 15, 2012 by oileng.